Ballinlough Refrigeration Ltd was recently named as the Thermo King Trailer Dealer of the Year for 2016. The coveted award capped a memorable year for the company in which it celebrated 30 years in business and relocated to a new state-of-the-art premises in Kingswood, Dublin 22. Thermo King, the global manufacturer of transport temperature control solutions, bestowed its highest honour on Ballinlough Refrigeration at its annual dealer conference held in Tenerife on Thursday, January 26 last. The Dublin-headquartered company was chosen from 120 Thermo King dealers in Europe, Africa, the Middle East and Russia. “Just to be nominated was an achievement in itself,”Ballinlough Refrigeration’s general manager Joe Malone says. Not only that, but Ballinlough Refrigeration was awarded a major contract to fit 200 trailers (114 of which were Thermo King) and 190 Dhollandia tail lifts on a fleet of new trucks for DHL. These were due to go into service on Monday, March 6 last. The firm has experienced unprecedented growth in the last two years and Joe expects this trend to continue on the back of the move to the new Kingswood site on the Old Naas Road. “We now have over 100 staff, which is the most we’ve ever had on our books,”he explains. “Our new Dublin site has facilitated the growth of our business. Formerly the Renault Truck Centre, the premises is 40,000 sq. ft. which is over 10,000 sq. ft. bigger than our old premises in Ballymount. The addition of a new four-bay workshop has given us greater capacity to cater for the needs of our existing and new customers. “While most of our customers are involved in the food and retail sectors, we have a growing customer-base in the pharmaceutical industry. Andrew Reilly, who is a GDP (Good Distribution Practice) Champion, oversees the GDP systems with each pharma client. The objective of the GDP guidelines is to ensure that the high level of product quality, determined by good manufacturing practices, is maintained throughout the distribution chain. A multi-franchise nationwide service and repair company specialising in Thermo King transport refrigeration and Dhollandia hydraulic tail lifts, Ballinlough Refrigeration has come a long way since Joe Jordan set up the business in Ballinlough, Co. Roscommon in 1986. The company was appointed sole Thermo King dealer for Ireland in 1992 and acquired the Dhollanida Tail Lift dealership for Ireland three years later. 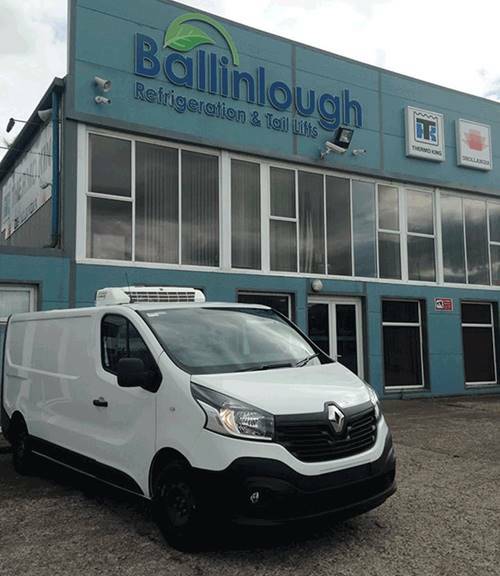 Ballinlough Refrigeration’s Dublin head office is complemented by further outlets in Cork (Annacarton Road) and Ballinlough. In addition, the company has service affiliates in all areas of the country who are fully trained and supplied with genuine Thermo King and Dhollandia replacement parts. The business boasts a considerable portfolio of products and services from food safety, pharmaceutical compliance and temperature mapping, specialist tail lift applications and bespoke total management solutions with individual teams looking after each segment. Ballinlough’s after -hours service is second to none with service engineers available 24 hours a day, 365 days a year. Ballinlough Refrigeration’s customer-base includes Tesco Distribution, Tesco.com, SuperValu, Dunnes Stores, Kerry Foods and the Irish Blood Transfusion Service Board as well as almost every main local and international haulier in Ireland. All of these and many more customers use Ballinlough Refrigeration because of the wide range and sustainability of the products its sells and its commitment to keeping its equipment fully serviced and operational at all times. Ballinlough is proud to fly the flag for Thermo King and Dhollandia in Ireland. Thermo King offers a comprehensive range of product solutions specifically designed for the transport temperature control industry. The company prides itself in the research and development of market-leading innovative solutions to ensure it continues to offer customers the most reliable, efficient and effective products. By joining forces with Frigoblock, Thermo King has the most comprehensive portfolio of products and services for the transport refrigeration industry. Thermo King backs its customers with the largest global network of certified dealer service technicians for trucks, trailers, buses, rail cars and marine refrigeration units. Dhollandia are the number one manufacturer of tail lifts in Europe with production of more than 28,000 units per year in five countries. Dhollandia boasts an unparalleled product range with capacities ranging from 150 to 16,000kg. Ballinlough Refrigeration are also agents for the Novum range of plug-in freezer cabinets and have installed many of these in Vivo, Mace, Costcutter and Spar outlets. Novum specialises in supplying high-quality refrigeration to the frozen food retail sector. The company is a market-leader in innovation and styling, recognising the speed of change in customer’s tastes and expectations. The Novum cabinets include four different ranges, each designed to meet the various requirements of the retail sector. Other brands Ballinlough represent are Waeco Mobile Solutions and Koxka supermarket display cabinets.